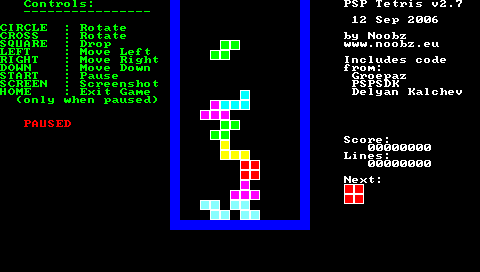 an ASCII-based arkanoid homebrew clone, compatible with all firmwares 2.0 - 2.8. The game offers sweet, though occasionally choppy, gameplay, but definitely brings back tears of nostalgia from the good ol' DOS days. By Percival , Robert A. Notes for this version: Should be fine for 2.0-2.80. Notes for this version: Works on TIFF (PSP's firmware 2.00 - 2.80). Created by pspwner. Pong for 2.7-2.80 TIFF users. Notes for this version: Good old Pong. plays like Bomberman and can actually be played by two players. One person uses the D-pad to move around and hit the L shoulder to drop bombs while the other uses the X, , /_, O buttons to move and the R shoulder to plant the bombs. For single player, it's the D-pad to move while hitting X or O to drop. Notes for this version: Teleporters and 6 more maps added. inspired by the game Bomberman. Notes for this version: Has extra maps and allows custom maps.